A Christmas attraction which kept running despite a council ordering it to stop trading has won a High Court battle to stay open. Christmas Wonderland, in Clacton, Essex, was issued with a temporary stop notice by the council because it was set up without planning permission. Tendring District Council attempted to get an injunction, but the judge ruled in favour of Christmas Wonderland. The authority said it would consider if it was going to take further action. The operators of Christmas Wonderland, which is based at St Johns Plant Centre, said they were "delighted" to have defeated the legal challenge. "Once again we would like to thank everyone for their continued support," they added. The site sells Christmas lights and gifts, and has a grotto, animatronics and a "Santa Express" miniature railway. 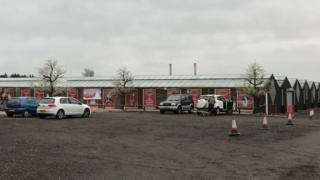 A planning application to run a "temporary Christmas Wonderland" and "seasonal sales event" on land owned by a garden nursery was lodged by organisers just days before it was set to open in October. But Tendring District Council warned the organisers its application was likely to be refused because of "serious road safety concerns". The temporary stop notice was put in place on 6 December - following a traffic accident on the road into the attraction - to immediately prevent the site from operating. But Christmas Wonderland continued to operate. The leader of Tendring District Council, Neil Stock, said the authority had decided to take the case to the High Court "to demonstrate that we will not stand idly by and allow a blatant disregard for the democratic planning process to go unchallenged". "This is a case of a business seeking to cash in on Christmas without proper regard for customer safety or the impact on other road users," he said. "This unauthorised business has had all year to sort this matter out but has chosen not to do so." The judge in the case declined to award costs against the council.